Ocean Lakes Family Campground has several beautiful pools, including our new water park amenities at Sandy Harbor (see Pool Rules for height/weight safety info). A large sun deck that includes reclining chairs for sunbathing and several kiddie pools and our interactive wading pool Sandy Harbor Splash Zone. The pool deck is surrounded by landscaping and is part of the Sandy Harbor Family Fun Center with restrooms and changing areas. Enjoy a meal or snack at Sandy Harbor Cafe adjacent to the pools and Sandy Harbor Mini-Golf. Certified lifeguards are on duty during the summer season. Ocean Lakes takes great care with its pools, which are serviced daily. The “All-Seasons” indoor pool is open year ’round and is heated in the winter time. Water aerobics have become very popular throughout the year with guests of all ages. Generally, Ocean Lakes’ [older] outdoor pools (not water park) have always opened for swimming at Easter. The new Sandy Harbor Water Park style amenities will probably be open Easter Weekend only, then close until May. In May, it will be open on weekends with “hours as posted*” until Memorial Day Weekend. That may include shutting off the slides on the Drop Zone, The Tube and Splash Zone while leaving the other parts of Sandy Harbor open for guests. We appreciate everyone’s patience as we find what works best for our operational needs. 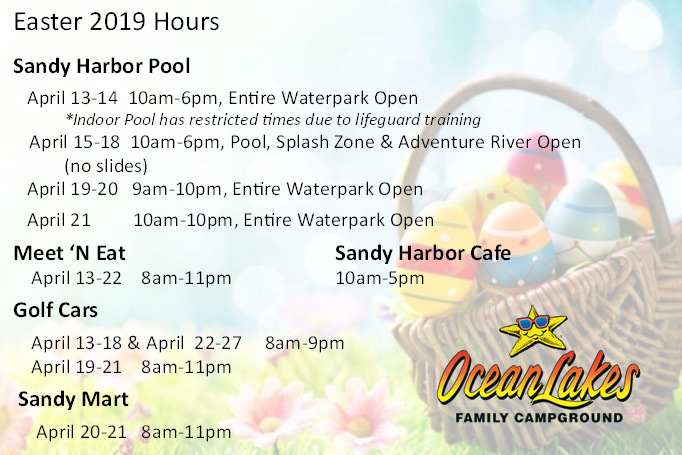 * See Sandy Harbor Water Park Hours below. Outdoor pools close for swimming in the fall. Indoor Pool is open all year! Easter Weekend | Sandy Harbor Water Park will be open for the big Easter Weekend crowds. For 2019 that is: Friday, April 19th through Sunday, April 21, 2019. See Easter Hours Here. Then it will shut down until May 1. May* | Starting May 1, SHWP will be open on the weekends only with “hours as posted” until Memorial Day Weekend. Opening the Water Park may include shutting off the slides on the Drop Zone, The Tube and Splash Zone while leaving the other parts of Sandy Harbor Water Park (the Adventure River and Splash Zone structure) open for guests. Summer | Our water park will open full time Memorial Day Weekend and continue through Labor Day. Fall* | Our water park will stay open under “hours as posted” through Sept. 1 – 30. * Opening the Water Park may include shutting off the slides on the Drop Zone, The Tube and Splash Zone while leaving the other parts of Sandy Harbor Water Park (the Adventure River and Splash Zone structure) open for guests. Open Monday – Friday, 10 AM – 6 PM – Adventure River, Splash Zone (all slides will be closed including The Tube, Drop Zone Mat Racer and on Splash Zone for kids). Open Saturday – Sunday, 10 AM – 6 PM – Adventure River, Splash Zone, Drop Zone Mat Racer, The Tube. * Hours NOTE: Please understand, Sandy Harbor Water Park defines all the water park elements, not just the slides. We appreciate everyone’s patience as our team works hard to provide this amenity for your enjoyment.